Lab analyses indicate that quality decline for first cut was very fast, and test results range from low to very high quality. Producers cutting based on calendar date rather than crop stage may have lower quality forages than expected. Pasture regrowth has been slow, and many producers are already feeding stored forages. Fields where livestock were turned out too early this spring are more likely to be short of grazing now. Slowing down the rotation and lengthening rest periods will help pastures recover. Post-grazing residuals are important for grass recovery: move cattle to fresh grazing before grass is down to 10 cm (4”) tall; sheep should be moved before grass is down to 6 cm (2.5”) tall. Research has shown 80 kg/ha oats + 50 kg/ha N (70 lbs/ac oats + 45 lbs/ac N) results in good forage yields at a low cost after winter wheat. Growers could add peas to the stand if more protein is desired, but are encouraged to compare prices with other protein sources. Dry weather increases the likelihood of boron deficiency symptoms in alfalfa. Boron deficiency can look similar to PLH feeding. Boron symptoms appear in the newest leaves (sometimes called “yellow top”) while PLH feeding occurs all over the plant. As of July 30th, areas of Bruce, Grey, Huron, Perth, Wellington, Waterloo, Brant, Hamilton, Norfolk, Haldimand, Niagara, and Essex counties are drier than average. Middlesex, Oxford, Eglin, Peel, and York had higher than average rainfall. As of July 30th, areas of Prince Edward, Northumberland, and Hastings have received less rainfall than average. Ottawa, Lanark and Leeds & Grenville have received higher than average precipitation for July, while the rest of the region had average rainfall. This precipitation mostly fell in the last week of the month, as rainfall maps from July 23rd indicated the entire region received below average precipitation. 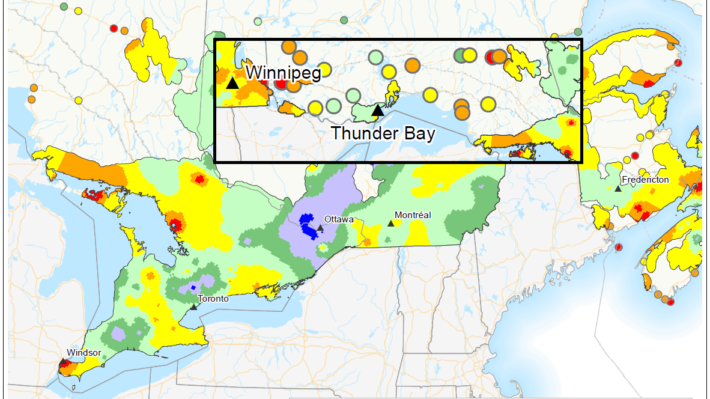 Dry conditions may prevent forages from growing through pest damage. Growers should be scouting for true armyworm in corn silage and mixed forages. Threshold for corn past the 6-leaf stage is if 50% of plants have leaf-feeding damage and are infested with larvae smaller than 2.5 cm (1 inch), provided the larvae have not been parasitized. 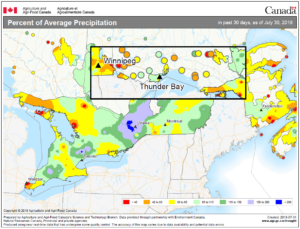 As of July 30th, districts throughout northeastern Ontario have received less rainfall than average. 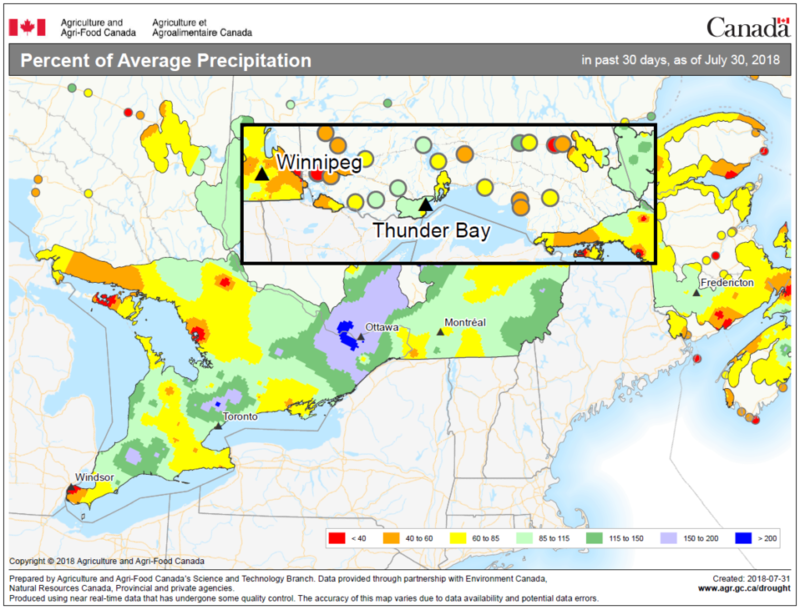 As of July 30th, areas of Rainy River and Kenora districts have received less rainfall than average, while Thunder Bay District had average amounts of precipitation.